Engineering absolute reliability and density, bundled with true mobility! 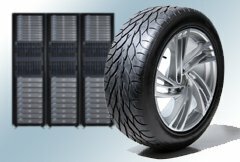 True mobility is the essential requirement for majority of mobile data center or disaster recovery platforms. Offering exceptional mobility possibilities, through innovative engineering and design, TechXact experts can cater “high-density” data centers platforms on the go. All components such as racks, cooling systems, fire suppression, chillers, capability to mount even extremely large satellite dish platforms, UPS as well as generators can be engineered to be completely mobile. Varied outdoor, containerized, rapid deployment, modular and compartmentalized data centers, disaster recovery centers, telecommunication and cloud computing applications, should be designed differently for varied applications. TechXact mobile data center engineering empowers all industry verticals, from telecoms to governments, developers, defense, aviation, financial institutions and many industries and operators to possess data centers that are application-specific to their exact needs. TechXact caters varied containerized and mobile DC designs and platforms that offer the required mobility, compactness, high density and capacity on lowest footprint, robustness and reliability. Ample customization is applied to the design and deployment parameters per client and per industry specific requirements as a value-add. TechXact engineers and experts deliver custom-made mobile data center and fast deployment data center configurations based on varied size, capacity, expandability requirements, environmental specifications, mobility and redundancy factors.